I had never heard of the cadborosaurus before spotting an obscure article on the creature the other day. The cadborosaurus, or Caddy, as the creature is affectionately known as, has been spotted several times in the last century off the Pacific coast of Canada. And not just from the "party on the beach with lots of mind altering substances" crowd. From actual biologists that like their careers and want to keep them. The sightings all seem to have a similar description, a creature somewhere between 5-15 meters in length, a neck 1-4 meters long, and a head similar in shape to a camel or horse. Flippers have been spotted so Caddy is a sea creature. There is a much publicized photo of some kind of creature that was taken out of the stomach of a sperm whale at Naden Harbour, B.C. in 1937. This is before digital retouching to make things that aren't real, real. And some other photos from a Russian site which are in keeping with the description of Caddy. The more I looked into crytozoology, the more fascinated I have become to understand this world we live in. And her many mysteries. And the people that go out and try and find answers to them. Because of the fantastic tales of mythology and legend, the real facts of what is out there looses credibility. And because so few of these creatures are ever seen, much less any examples of them ever found, they are dismissed as fantasies of overactive minds. Let's face it, anyone that has watched a Harry Potter movie would dismiss a coelacanth as fantasy if it flew right in front of them. And we know they are real. Rare, but real. I, for one, would like to believe that Mother Nature holds some secrets and mysteries close to herself. That some things are just too precious to share. 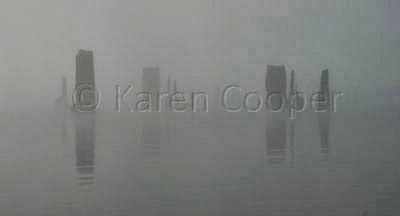 I have never seen a cadborosaurus, as my photo is actually a wharf in the fog (no digital retouching required), but I can believe when I look into the mists of nothingness, and imagine all the things I don't know. Sometimes mysteries should remain that way. I think of the Yeti when I read this as I recently watched a documentary about the people who search for "BigFoot". It's interesting and certainly would be a great find to discover a rare species. I recently heard a radio program on CBC that talked about a man in India who found hair samples that cannot yet be identified to any known species. So, who knows . . . Thanks Heather. I agree, I think there are some things we just don't know about, yet anyway. Hello fellow travel blogger! I love your articles on Canada, I'm hoping that I can visit that beautiful country someday so I can blog it also. Happy blogging! I hope you can visit one day ar-wee. Its such a beautiful country, it would take more than one lifetime to explore it all.